A version of this blog was originally published on The Conversation on 31 January 2018. Trust in politicians has fluctuated relatively little during the last 30 years in the UK. It remains stubbornly low. According to an index by the pollsters Ipsos-Mori, 18% of people said they trusted politicians in 1983, and 17% in 2017. Yet this hides some real changes that have taken place in recent years. As the rise of populist movements and decline of mainstream parties across Europe shows, the gap between politicians and citizens seems to grow ever wider. Recent surveys of the British public’s attitudes towards welfare spending show similar paradoxical findings. The authoritative British Social Attitudes survey shows that most people want far higher government spending on pensions, health care and education – but this is coupled with a reluctance to pay higher taxes. The reason is that people don’t trust the government to spend their money wisely. 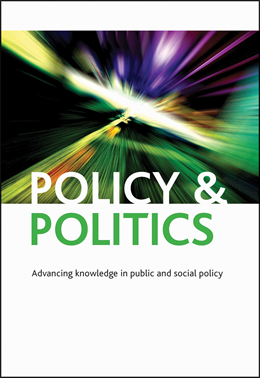 Our findings from the UK leg of the research just published in Policy & Politics show the main issue in discussions about the future of the welfare state is not so much a mistrust of individual politicians as a lack of confidence in the system as a whole. “The government” – regardless of the party in power – is perceived to make bad decisions. It wastes money, supports those whose actions damage society, penalises those who take responsibility for themselves and fails to address real conflicts and needs, putting the services people actually want under severe threat. You allow immigration more and more and more, the government have to spend more money on benefits for them instead of putting the money into education and social care and other kinds of stuff. Obviously, if we keep going on as we are now, there’ll be a lack of housing and space to house people … Again, it puts a strain on the NHS … we’re not the Promised Land, you know. I don’t have a problem if somebody is going to work and they are earning the money and the company they’re working for is prepared to pay them an extortionate amount of money, okay… why shouldn’t they take that home? But this renders valued services, such as pensions and health care, unsustainable. One woman on a low-income said “the NHS will be gone in five years”, while another who was unemployed said: “I don’t think there will be a state pension in 2040”. These democratic forums show that there is more to how people think than assuming their complaints are against the irresponsible workshy and immigrants who demand benefits. Many people believe that current policies actively promote behaviour that is threatening to society. Money is wasted, tax is unfair, key public services will collapse under current pressures – and yet the government still promotes irresponsible behaviour. One way forward would involve social investment in state services that help people to take greater responsibility for themselves. Participants emphasised their support for better access to childcare services – for those who work – and greater training opportunities. For instance they suggested companies could be given tax incentives to provide more apprenticeships and run day nurseries, and that more could be spent on further education for early school leavers rather than universities for sixth formers. Retraining opportunities for people who are looking to further their employment opportunities at an advanced stage of their careers should also be encouraged by government initiatives. Addressing the current mistrust of government does not mean rolling back the state, but rather putting the emphasis on social provision that is seen to be fair. Stressing the positive contribution of the welfare state by promoting social investment is a possible way forward. Given Britain’s existing socio-economic challenges, and the likelihood of a very delicate transition following the Brexit vote, society must work to rebuild trust between citizens and the government. Failure to achieve this could lead to further instability and uncertainty over the future of welfare policy.